Shiragami Youko is a half-vampire. Her father is a vampire while her mother is a human. 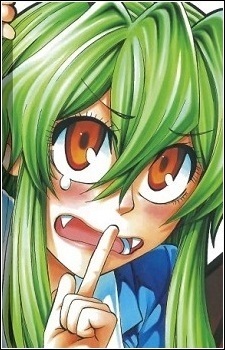 Youko is going to a human school under a condition that the fact that she is a vampire must be kept secret. However her secret was exposed to Kuromine Asahi, who intended to confess his love to her and witnessed Youko unfolding her wings in an empty classroom. As a vampire Youko possesses such characteristics as wings and long canines. She can easily hide her wings but can't do anything about her canines, which is why she avoids showing her teeth at school as much as possible. Youko is also weak to sunlight, but instead of turning into ashes she just gets tanned extremely fast. Being the dense person that she is, Shiragami took a long time to accept and understand how she felt toward Kuromine. After Kuromine's second failed attempt at confessing, Shiragami began to recognize what she was feeling toward him, but was ultimately confused due to her close friendship with Aizawa. Wanting to remain friends with all three, she repressed her feelings and "supported" their relationship; however, after the events of the class trip, Shiragami misunderstood the situation (as usual) and thought that Aizawa's confession to Kuromine was successful, this caused her to avoid contact with the two and cry heavily once she was alone. She hadn't realized yet that Kuromine hadn't given Aizawa and answer. In chapter 71, Shiragami admits to Aizawa that her feelings toward Kuromine were not sudden, bit in fact she has been in love with him since the events of chapter 1. This causes a slight strain on their friendship, as Aizawa "declares war" on Shiragami over which one of them was going to take his heart. After the misunderstanding following the class trip, Kuromine, encouraged by his friends, quickly goes to find Shiragami and clear up any confusion. He is assisted by Aizawa who follows in her space ship. Aizawa puts up a brave front and directly asks Kuromine for an answer to her confession to which he replies no, because he has someone else that he likes. After Aizawa makes her emotional escape, Kuromine finally confesses his love for Shiragami, and she hesitates, but eventually does the same. Finally, the two start dating.